It’s wise to have a good understanding of the current market conditions whether you are buying or selling. 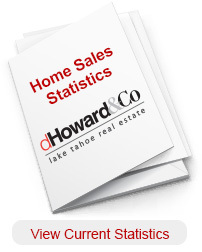 We encourage you to view South Lake Tahoe recent home sale statistics to see the current market conditions in the area. It’s not unusual for sellers to have an over inflated opinion of the value of their home. Often this comes from pride of ownership, which is not a bad thing. Homeowners who take pride in their homes usually keep them well maintained. This preserves the value of the property. Sometimes, however, pride of ownership can get in the way of making a rational business decision. It has often been said that the first offer is likely to be the best one you’ll receive. While this saying doesn’t hold every time, it does contain a kernel of truth. Your best chance of selling your home for the highest price is when it is new on the market. If a property is priced right for the market, and the market is active, you might receive an offer, or offers, within the first several weeks of marketing. Buyers tend to make aggressive bids for high demand listings in order to beat the competition. After your home has been on the market for a period of time with no offers, you are less likely to receive aggressive bids, unless the market changes in your favor over time. However, if the market is steady or slows, you could find the appeal of your home diminishing over time. This usually equates to fewer offers at lower prices. Buyers typically ask how long a listing has been on the market and discount their offer accordingly. Home seller tip: You’re taking a gamble when you turn down a strong offer from a well qualified buyer. If you wait, you might not see as good an offer later. If word gets out that you rejected a good offer, this could discourage other buyers from making offers. They may wonder if you’re serious about selling. Just as it’s risky to turn down a good offer in hopes of something better, it’s also risky to accept an offer before your home has been exposed to the market. If your home is priced at or under its market value and it hasn’t been adequately marketed, you could shortchange yourself. Before you sign a listing agreement, make sure that your real estate agent will provide you with an aggressive marketing program. You want as much exposure for your home as possible, as quickly as possible. If your home is priced right for the market, and it receives comprehensive marketing, you should feel confident that the offers you receive reflect the current market value of your home. If after professional marketing exposure, you receive an offer or offers that are less than you had hoped for, you may need a reality check. Your pride of ownership could be clouding your judgment of current market conditions. The Closing: Your home is only worth what a willing and able buyer will pay for it in the current market.